Kids Event – Clean, Fun, Interactive! 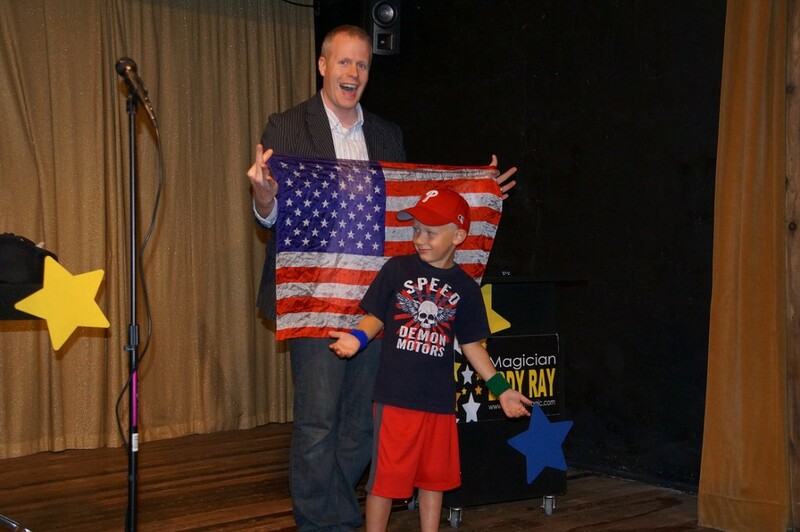 Keeping kids laughing, smiling, and enjoying themselves is what Eddy Ray’s magic shows can do for your event. We offer many different options and can customize a show for your event. All the kids will witness hilarious antics of my special pet, Richard the Fox. They’ll also participate in many of the tricks and even learn a trick themselves! Our magic shows for kids usually last 30, 45, or 60 minutes depending on your needs. Small groups or large, our shows will be visual, interactive, and FUN! Some clients include: Goddard School, Tutor Time, Geigertown Church, and more. Whether it’s a birthday party, school program, child center or other event please contact us right now for more information and a free quote. Family Event – Perfect For All Ages, Interactive, Amazing! Pennsylvania Magician Eddy Ray’s magic shows are full of clean comedy, audience interaction, and amazing magic. We offer many magic show packages for families events including: private parties, family reunions, block parties, and many more. Any kind of event you can think of, Eddy can help make it memorable and AMAZING! Some clients include: Bernville Community Library, Alex’s Lemonade Stand, Big Brothers and Big Sisters, and more. 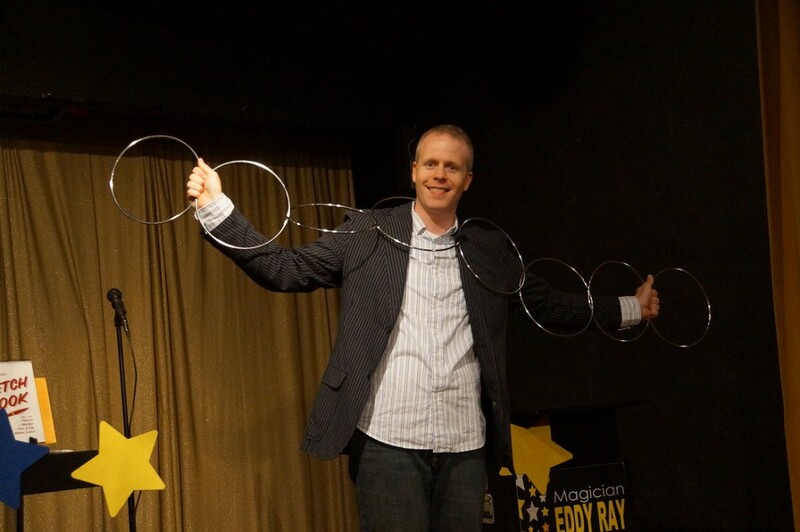 Stand Up Magic Shows – Eddy Ray offers a stand up magic show that can last 30, 45, or 60 minutes. During the Stand Up Show, guests will have their minds read, solid metal forks will bend using only the mind, playing cards will appear and disappear with ease, your guests will interact and become the stars of the show! This is the perfect show for large gatherings where people will be seated. This show can be performed for as little as 20 or as many as 500 or more. Strolling, Mingle Close-Up Magic – In addition to Magician Eddy Ray’s amazing Stand Up Magic Shows we also offer close-up magic. Eddy will be strolling around from group to group performing close-up magic. Watch your guests react in amazement when borrowed objects such as money and rings floating, disappear and more! Every small group of people gets their own mini 5-7 minute close-up magic show, then Eddy moves to the next group. This is perfect for weddings, festivals, private parties… anywhere! Add a touch of magic to your event! Our strolling close-up magic is performed by the hour depending on how much event coverage you need. Typically 100 people can be covered within an hour. Adult Events – Sophisticated Magic, Mind Reading, Clean Humor! Pennsylvania Magician Eddy Ray is available for your next company (corporate) banquet, sales meeting, trade show, luncheon etc. Keep in mind that Eddy Ray provides the highest level of professionalism and only performs a CLEAN and FUN show. There is no blue humor, just TONS of audience interaction, amazing mind reading, and cool magic. This type of entertainment and show is more sophisticated for the adult crowd but there is no need to worry if kids are around. Eddy’s provided all sorts of companies with high quality entertainment. Here are a few: Entech Engineering, J.C. Ehrlich, Atlantic Energy Concepts, Certified Public Accountants and many more. Strolling, Mingle Close-Up Magic – In addition to Magician Eddy Ray’s amazing Stand Up Magic Shows we also offer close-up magic. Eddy will be strolling around from group to group performing close-up magic. Watch your guests react in amazement when borrowed objects such as money and rings floating, disappear and more! Every small group of people gets their own mini 5-7 minute close-up magic show, then Eddy moves to the next group. This is perfect for banquets, grand openings , special events… anywhere! Add a touch of magic to your event! Contact Corporate Magician Eddy Ray for a free quote and information, don’t delay! Eddy Ray brings his magic shows to major areas throughout Pennsylvania including citites, towns and counties such as: Allentown , Harrisburg , Lancaster , Lebanon , Pennsylvania , Pottstown , Reading PA , York , West Chester , Gettysburg , Pottsville , Elysburg , Wilmington , Dillsburg , Easton , Chambersburg , Boyertown , Ardmore , Newmanstown . No town or city is too big or small as Eddy has a variety of magic entertainment options suitable for small and large audiences of all ages. He's performed in areas including, King of Prussia , Delaware County , Bucks County , Bethlehem , Coatesville , Doylestown , Jim Thorpe , Lititz , Lehigh Valley , Chester County , Manheim , Downingtown . If you do not see an area listed here please contact Eddy and he can give you an idea of whether he can travel to your location. Aside from Pennsylvania he also performs in New Jersey, Delaware , and Maryland. Here are more locations you might see Eddy performing at regularly, Sunbury , Schuylkill County , Royersford , Norristown , Newtown , Bensalem , Exton , Carlisle , Mechanicsburg , Lehighton , Hazleton and other such locals as Quakertown , Hanover , Hershey and Radnor . Are you in one of these areas? If so, contact Eddy Ray today on how you can bring him to your next event! Palmyra , East Petersburg , Selinsgrove , Audubon , Nazareth , Red Lion , Pennsburg , Williamsport and Montgomery County . Be sure to check out Eddy's other websites including his programs for assemblies and other destinations in PA like: Berks County , Allentown Clowns , Cheltenham , Eddy's CMP site Certified Magic Professionals , City of Brotherly Love Philadelphia , Wilkes-Barre , and his Assembly Programs . Planning a kids birthday party? Make sure to visit this site PA Birthday Party Magician or if you need a clown: Clown Party For Kids . If you want to learn magic to entertain your friends visit the secret magic club at Secret Magic Club and read a ton of reviews for Eddy at PA Magicians Reviewed . Interested in an Eddy Ray souvenir or magic trick and book? Visit his magic shop!